Peter did it again! 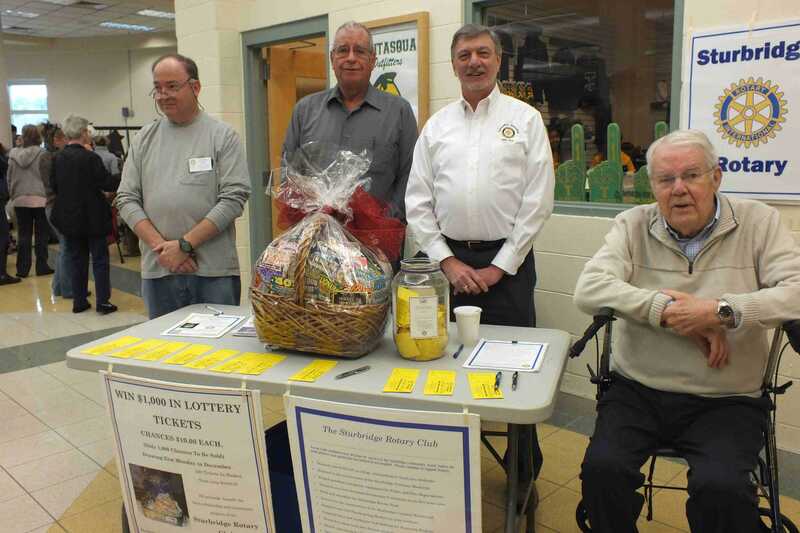 All tickets have been sold for the Lottery Basket Fundraiser. The last of the tickets sold fast at the Tantasqua Craft Fair held on November 14. Tickets were being sold at the rate of one per minute and we could have sold more. The afternoon shift was cancelled for lack of tickets to sell. 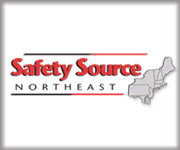 We would like to pull the winning ticket by the end of the month. Thanks to all those who worked selling tickets and especially to Peter for all the time and effort he put into organizing everything and spending countless hours selling tickets as well. 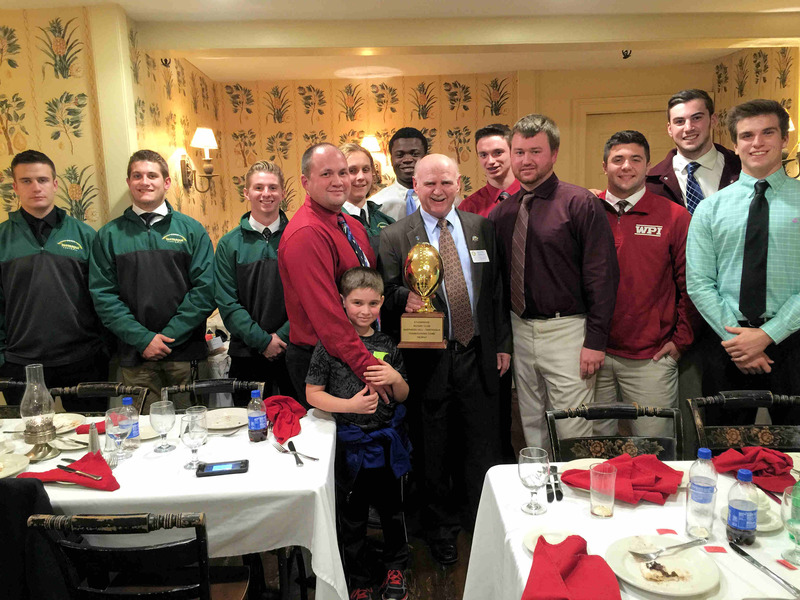 Our special guests were the football coaches and captains from Tantasqua and Shepherd Hill who will be facing off during the annual Football game on Thanksgiving Day at 10:15 AM at Shepherd Hill. As you may recall, last year they played at Tantasqua on a frozen snow-covered field. Both teams are hoping the weather will be a little more cooperative this year. Each coach stressed the benefits of playing football, from building good character, fortitude, sportsmanship and determination – all attributes needed to be successful in life. Coach Ryan from the Shepherd Hill Rams brought five captains and players from his team and Coach Joe Beveridge from the Tantasqua Warriors brought his son Landan and four captains and players from his team. Both teams are vying for the Rotary Homecoming Football Trophy awarded each year to the winning team. The coach and captains from the winning team will come back to claim the trophy on November 30. 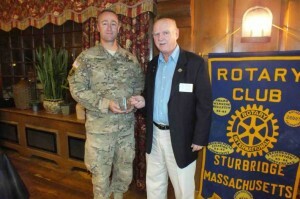 Colonel Tom Stewart of the Massachusetts National Guard spoke at our Monday meeting. 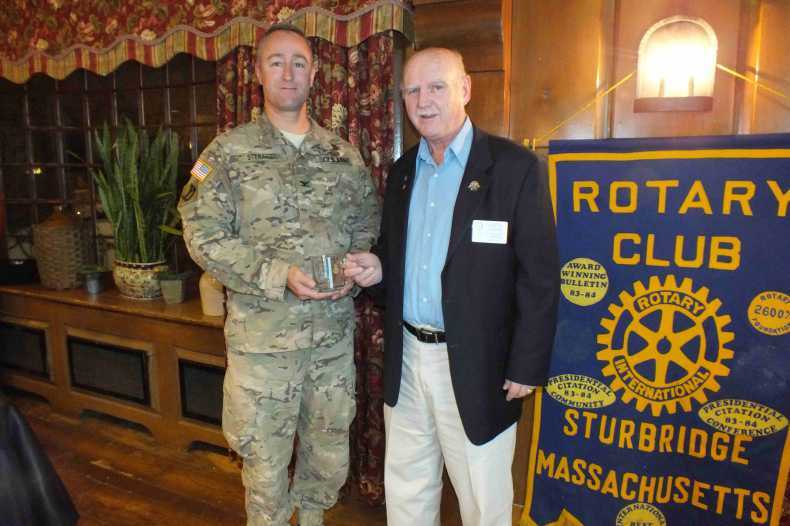 Colonel Stewart is past commander of the 182nd Infantry Regiment 1st Battalion. He spoke of his 2011-2012 Deployment to Afghanistan. The Colonel gave us a brief background on the Colonial Regiment which was established in 1636. The shot heard ‘Round the World’ on April 19, 1775 was that of the Colonial Regiment. To date, the regiment has participated in nine wars. 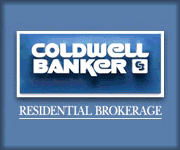 Colonel Stewart grew up in Walpole, MA and currently lives in Sturbridge. 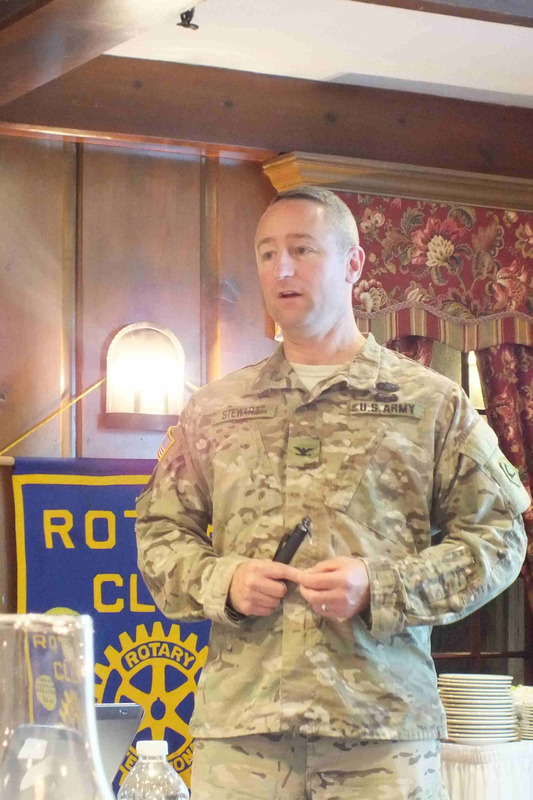 He described the four missions of the182nd Infantry Regiment including helping the Afghans work to improve their health infrastructure. Colonel Stewart and his men worked hard to build relationships of trust with the Afghans. 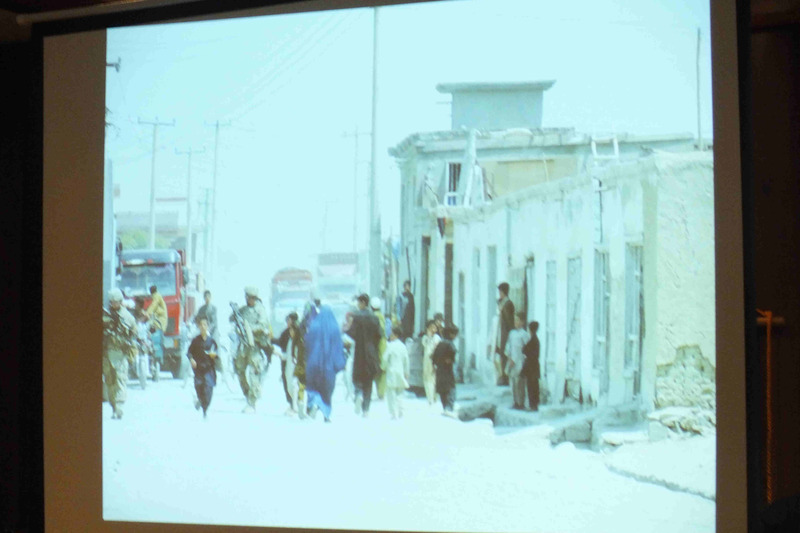 He showed many slides including the unbelievable poverty and poor living conditions. The soldiers gave the Afghans some clothing for the men, women and children including boots to wear in the snow versus the flip-flops they wear all year long. He described the danger he and his men were in not knowing who they could trust. Each soldier was vigilant at being totally aware of his surroundings checking for snipers or bombs. He concluded that his regiment returned home without any casualties, however, there were five suicides while everyone was trying to acclimate to the mainstream of life at home. A very enlightening and moving presentation. All members agreed that we have so much to be thankful for including our brave and honorable men and women of the armed forces risking their lives to keep us safe. 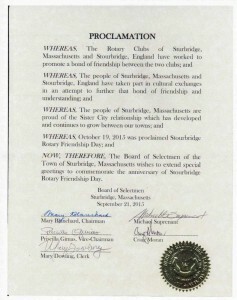 Each year in October we celebrate Stourbridge-Sturbridge Rotary Friendship Day. 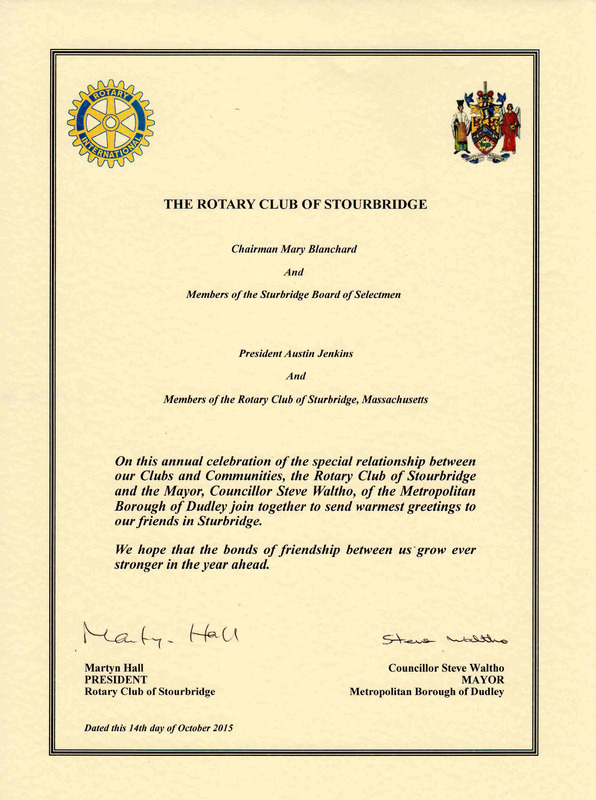 We became ‘twinned’ with the Stourbridge, England Rotary Club over two decades ago and the bond of friendship between both Clubs continues today. Klaus gave a presentation to the newer Club members on the history of our Sister Club including showing them where the Stourbridge Club is located in the Midlands. 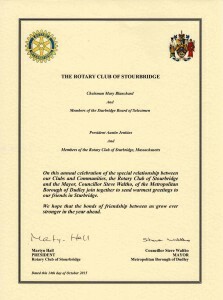 President Austin then read a letter of friendship he received from Stourbridge Secretary Fred Shaw and Sturbridge sent a letter of friendship to Stourbridge President Martyn Hall. 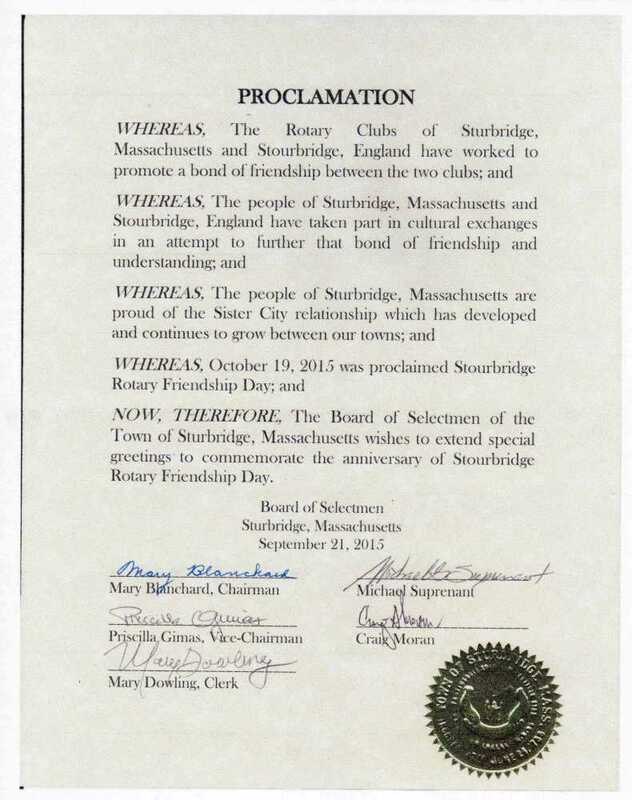 Both Clubs also exchange formal greetings from respective town leaders honoring the long-standing relationship between the two Clubs. This exchange is an honored tradition.